The Seychelles has created protected areas "the size of Great Britain" in the Indian Ocean. In exchange for getting some of its national debt paid off, the island nation has agreed to protect 210,000 sq km (81,000 sq miles) of ocean. The reserves will limit tourism and fishing activities in the Seychelles to halt further damage to aquatic life. A foundation set up by actor Leonardo DiCaprio is one of the investors that worked on the deal. The Oscar winner said: "This effort will help the people of Seychelles protect their ocean for future generations, and will serve as a model for future marine conservation projects worldwide." Seychelles President Danny Faure said: "Our large ocean brings development opportunities but also responsibility. "By planning properly to protect our environment, we can be sure we are also protecting our people and their livelihoods against an uncertain future. " This is understood to be the first debt swap designed to protect ocean areas in the world. The Seychelles government agreed the debt swap with the Nature Conservancy, a US charity, and a number of investors back in 2016. Under the terms of the $21m (£15m) deal, the charity and the investors - including the Leonardo DiCaprio Foundation - paid for a portion of the Seychelles national debt. The country will then direct future national debt payments into a new trust, the Seychelles Conservation and Climate Adaptation Trust (SeyCCAT). This trust will offer lower interest rates on debt repayments, and any savings will go to fund new projects designed to protect marine life and handle the effects of climate change. 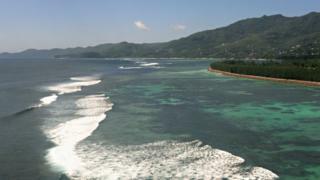 The Seychelles is raising the percentage of its protected waters from 0.04% to 30% by 2020 as part of the agreement. This first part of the plan creates two new marine parks. The first covers the Aldabra islands, home to hundreds of thousands of tortoises, nesting bird colonies, and the dugong - one of the more endangered species in the Indian Ocean. This area will be fully protected, with only research and regulated tourism allowed. The second area concerns the seas around the Seychelles' main islands and will limit the fishing and tourism activities there. "This is a critical accomplishment in our mission to bring conservation to scale across the globe," said Nature Conservancy CEO Mark Tercek. "What you see today in Seychelles is what we expect to introduce in the Caribbean and other ocean regions facing the threats of climate change."